Furnace Fixers, Inc., the leader in In-Line Stress Relief Conveyor Ovens, is proud to announce our new line of industrial coating machines. These machines are designed to use the Thermadep® Coating Process, which is licensed to Egyptian Lacquer Mfg. Co. by SC Johnson. Thermadep® coatings apply a polymetric coating, which provide provides rust protection and color coats parts for identification. The beautiful thing about this process is that it does not increase labor. 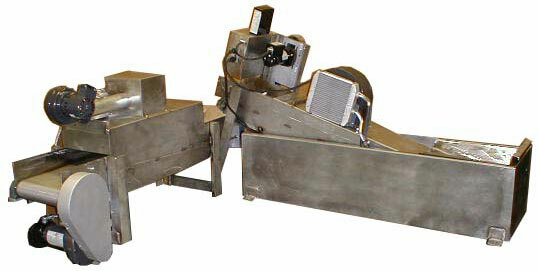 This simple process utilizes a heating source, such as our MKP Conveyor Ovens to heat a product to a minimum of 500ºF. The parts are then dropped into our coating tank and transferred out onto a drying conveyor, and finally into a carton for shipping. This is a simple, compact system. The product is coated right at the heat source, which is already being used for another purpose (stress relief, temper, etc. ), and required floor space is kept to a minimum. The coating solution is environmentally safe, water borne polymer, which contains no hazardous solvents. VOC’s are minimal. It is ideal for the color coding of springs and other metal products. It provides excellent humidity resistance as well. Please refer to the Egyptian Coatings for further information. Furnace Fixers, Inc. manufactures systems which are rated from 100# to over 1,000# per hour. This system is ideally suited for many industries, including spring manufacturing, forging, and the agricultural industry. These systems go hand in hand with our in-line ovens. The systems are geared toward all types of coating applications. We accomodate smaller products, such as compression and extension springs up to heavy work tools such as sledge hammer heads and wrenches. The coating systems are great for coloring and rust-proofing your product. Our systems typically range in size from a 6" system to a 44" wide system. Whether you are just looking for a conveyor (flat, incline or adjustable) or a complete system to move your parts more efficiently, Furnace Fixers can help.